1. Connect your computer to the iPhone through Usb cable and sync cradle. 2. Now set the iPhone in the cradle. iTunes will automatically launch and it will identify your iPhone. 3. Tap on the iPhone icon in the left navigation part of iTunes program. You will get a display that will provide you summary of your iPhone and has some tabs beside the top of the opened window, now find "Contacts" amongst them. 4. 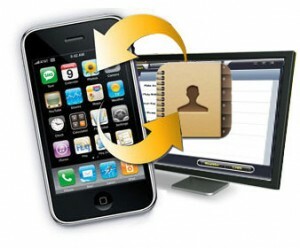 Press on the "Contacts" button and choose the desired contacts you want to sync with your iPhone. Now you have to select which program you want to sync from your contacts. Mac customers should use "Entourage" or "Address Book." Computer customers should use "Outlook Express" or "Microsoft Outlook." 5. Now Press the "Sync" key at the base of the "Contacts" section. You can see the sync process e in the top center of the tab. Keep your iPhone connected till sync is fully completed. 6. After finishing remove your iPhone by pressing on the "Release/Eject" key close to your phones icon in the left border. 7. Now can see your contacts on your iPhone. So you have got your iPhone contacts again through your computer /laptop. Enjoy…..